Between packing lunches and sports weekends, snack foods have started taking up a bigger portion of my budget. There haven’t been too many breakthroughs in terms of the variety of portable, healthier, non-perishables. My choices seem to be cheap and bad for you, or healthy and expensive. Organics? Hardly ever an option. I wasn’t sure about taking my local Grocery Outlet up on their snack food challenge. I’m not used to shopping without coupons and couldn’t see how I’d be able to save money without them. Plus, I thought the store would be filled with brands I’d never heard of. I was wrong on both counts. Since I’ve been paying attention to prices for so long, I have a good sense of when an item is priced well and when (even on ‘sale’) it is not. This knowledge came in handy while I was shopping. I picked up 26 items* and paid $29.34. When I took my receipt to Vons to compare, the savings were very clear. I found six items that were identical to the ones I purchased at Grocery Outlet. If I had purchased the same things in the same quantities from Vons, I would have spent $26.85 for only 10 items. That’s a significant difference. 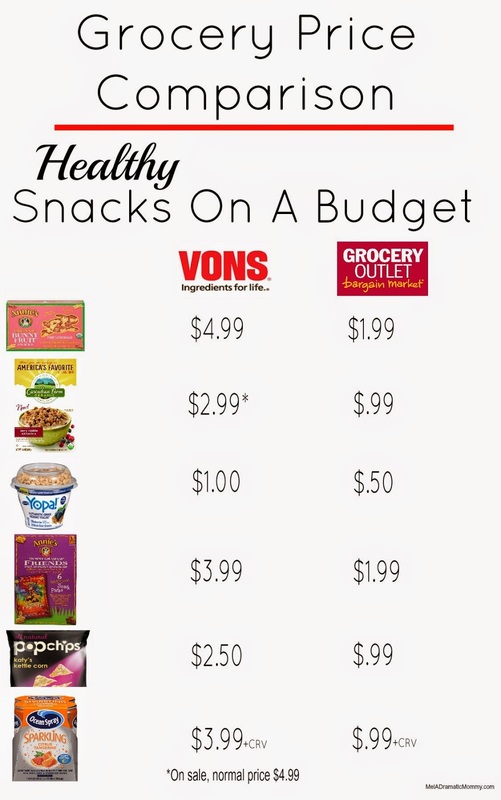 Again, since snacks go so quickly in our house, they’re something I keep an eye on because they can quickly take over my grocery budget. Now, will I see these same items the next time I go to Grocery Outlet? Maybe. Maybe not. But I’m fine with that. I’d rather a slightly rotating inventory with low prices than the same things over and over. Overall, I’m happy with my first experience and can say with certainty I will go back again. *There should be two more items in the photo: one more Yopa (I got hungry) and a 59oz bottle of Tropicana Orange Tangerine. For more of Melanie’s post and a $25 gift card giveaway, visit her blog, Mel, a Dramatic Mommy.